The Tamarud campaign gained 22 million signatures of Egyptians declaring their lack of confidence in Mursi as the president of government. Millions streamed into the streets of Cairo, Alexandria and other governates in Egypt to declare their will to have Mursi step down as president – in one word leave (irḥal!). The presidential elections were far from democratic blue prints of how elections should be run. Bumps are expected on the road to democracy, but perhaps not a circus. If the elections had not been ‘administered’ so that Shafiq ran against Mursi in the second presidential round, there might have been a stand off between Al-Sabahy and Mursi – which might have yielded a different result. Or indeed any two other candidates if Shafiq had not been re-entered into the presidential race at the very last minute. 22 million signatures far exceeds the number of people who voted for him in the presidential elections. This was also backed with millions in the streets of Egypt, chanting ‘Depart means leave!’ (irḥal yanʿī imshī) – it is not a subtle message. It also puts Mursi’s claim to legitimacy in a slightly more murky light. ts further. In fact, the constitutional process was a highly contested and key to why he has lost legitimacy on the street in the very first place. Not only did representatives of other political fractions not feel represented and involved in the actual drafting of the new law, but Mursi later tried to put himself above the law. In addition, the constitutional law was passed in a referendum with record low participation. These factors suggest that the argument of hijacking or disrupting Egypt’s steady road to democracy is flawed, or at least slightly inaccurate. I sympathize with the immense pressure Mursi and the Muslim Brotherhood have been under lately. The conflict appears personified. But, I would claim it is not Mursi per se, but it is what he has come to represent to his critics through previous mistakes and holding on to one term ‘legitimacy’ regardless of all countering signs from the street. Jokes have been flourishing about how disillusioned Mursi is – when he can put the word legitimacy in ‘365’ times in a two hour speech to the nation – a talk totally devoid of any real content, or any intention of addressing what the most vocal majority of the people are demanding. The parallels to Mubarak’s dealing with criticism in those crucial 18 days – are not lost on the audiences. Yet, I feel that Mursi and the Muslim Brotherhood have brought a lot of the critique upon themselves. This does not mean that the oppositional forces have been without their mistakes. It is true that at times the oppositional forces have appeared to have only one talent, namely ridiculing and critiquing the Muslim Brotherhood. They have often appeared without an alternative route or even plan on how to govern Egypt. But, now they finally got their act together, the Tamarud campaign was a huge success and now – there is a plan for the future – not picture perfect – but a plan. Once again uniting millions of Egyptians under simple demands, bestowed upon them yet another miracle – Mursi out of office. The military were called upon to assist in this transitional phase. Yes, there are dangers! The military is no neutral force in Egypt, and has extended and direct interests in both politics and finance. But, excuse me for saying this – everybody knows that. Just as the involvement of SCAF in 2011 was a risky engagement in the ousting of Mubarak – so is the current wedlock. The Tamarud campaign has urged in most explicit terms the military to only protect the Egyptian nation and its civilians and its nations – not to govern. The problem of course is what is to be considered protection of the nation. Eliminating the voices of opposing views? Competing interpretations of just what this means – is likely to cause even more strife. 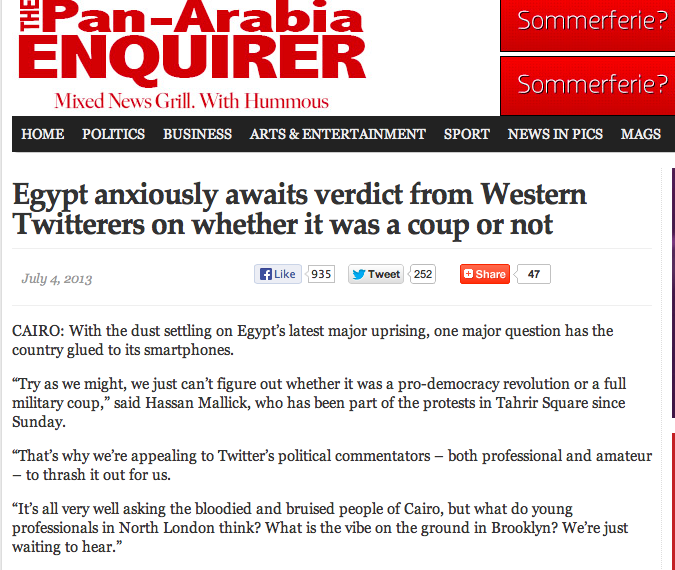 There have been several discussions in newspapers about whether what Egypt witnessed was a military coup or not. 1. It was a military plot and a bloody, violent, and militarized take over of power. The military ceased an opportunity to ‘side with the people’ and anti-Mursi demonstrators. Yet, this does not mean that Tamarud-supporters are blind, naïve, or think that there are no problems ahead, or even believe that the military has not been playing a major role all through Mursi’s reign or may try to take too much control in the weeks, months or even years ahead. In fact, the military have seen to it that all their interests are highly protected regardless of who is in charge. I find that ‘military coup’ misses the crucial point of popular agency among the millions who worked towards this monumental change. And since the ‘coup’ argument often goes hand in hand with the ‘overturning democracy’ argument, I think that too is an inaccurate description of the state of affairs in Egypt since Mubarak’s heyday, which does not mean that there are not huge problems that lie ahead of Egypt concerning how to ensure that civilian rule and a tolerant atmosphere is established. It is the topic of agency that concerns me, talk of a military coup clouds the agency of the Egyptian people, and the need for millions Egyptians to believe that they can change their country into something better than what it was a few weeks ago. Egyptians have enough worries about the strife and political and fractional turbulences that lie ahead as it is. On a personal note, I’ve tried to introspectively analyze why it is we, who are Egyptian, academics or otherwise – who appear to have the urge to oppose the ‘military coup analysis’ with every fiber of our body. I think it has to do with something very fundamental, calling it a military coup – takes away from us the possibility to instigate change or even hope for a better future for our country and our people. Also, it presents the somewhat glum picture, that the last two years were successful in terms of democratic change – or worse – that was as good as it will ever get. And, if there is anything ‘we’ need right now, it is hope that things will get better from here… Through the golden voice of Um Kalthoum I urge you: ‘Let me dream’, or rather let ‘us’ dream of a brighter future for our nation. Posted in Egypt and tagged Egypt, Mursi, Muslim Brotherhood, Sabahy, Tamarud. Bookmark the permalink. Hello, I believe your web site could be having web browser compatibility problems. When I look at your website in Safari, it looks fine however, when opening in IE, it’s got some overlapping issues. I merely wanted to give you a quick heads up! Besides that, wonderful website. also with the layout for your blog. Is this a paid subject or did you customize it your self? Anyway stay up the excellent high quality writing, it’s rare to peer a nice weblog like this one today..
* Over 70% who completed a Straighter – Line course felt it made them more likely to complete college. attending online college exists. This will enable others to share course ware and download lecture materials from your classes. You can also use the Neem Oil Treatment to spray on your hair. Go through testimonies and video clip demonstrations of the way they lessen lice safely for infected kids. others have already been infected. meat with salt and pepper,and if desired with the herbs. Always remember that essential oils are not the same as other oils. posts, except this webpage offers feature based writing. posts. Keep up the good work! You recognize, many people are hunting round for this info, you could help them greatly. I don’t know whrther it’s just me or if everybody else experiencing problems with your site. comment and let mee know if this is happening to them too? Revolution 2.0 or revolution in reverse?